Knights News · Oct 20 BACK TO BACK BULL CITY CHAMPS! Northern football remained unbeaten on the season and unbeaten in Durham for the second straight season after defeating Hillside 20-14 Friday night.. The Bull City Champions are now 8-0 vs. Durham schools the past 2 years. DURHAM, N.C. — The Hillside offense got plenty to time to watch and learn from the No. 14 Northern Durham Knights Friday night. 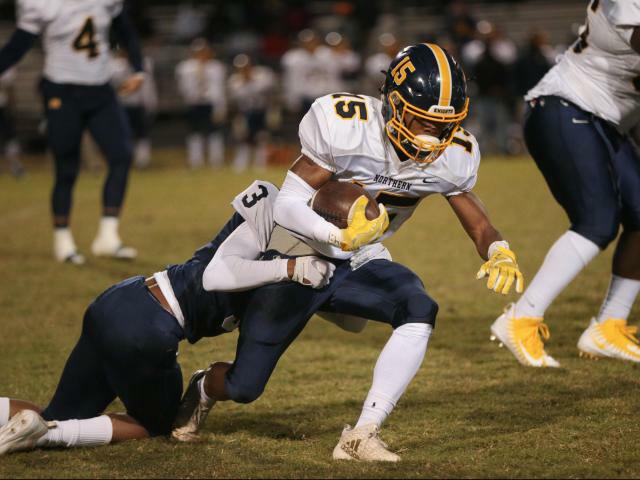 Unfortunately, they were watching from the sideline, stuck there by a productive Knights offense and two first-half interceptions by Laderrick Neville. Northern Durham started out selfish, holding serve on a 9:13, 15-play, 78-yard opening drive. After Anthony Freeman punched in from a yard out for the touchdown, it would seem to be Hillside’s turn. But instead of turn, Hillside committed the turnover — to Neville as time ran out in the first quarter. In the second, Northern Durham’s second TD came on a 34-yard pass to Karvell Oliver, but they flubbed the extra point to hold the lead at 13-0. Neville, again against the ticking clock, picked off Hillside QB Damian Harris to send the struggling Hornets into the break. It took some time, but Hillside mounted a comeback. The Knights would extend their lead to 20-0 late in the third and recover a Hillside fumble inside the Hornets’ red zone to prevent a score. When Hillside finally got on the board, it was with a 19-yard Harris rush. He’d add another touchdown, rushing from the 5-yard line and extending his arm to emphatically cross the plane. But the Hornets ran out of time, and Northern Durham held on for the 20-14 win and first place in the Big Eight 3A conference. They are 4-0, 8-0 overall and meet East Chapel Hill next week. Hillside (5-3, 2-1 Big Eight) hosts Northwood next week.